This book explores the theoretical and empirical dimensions of community crime prevention in China, examining in particular the role of social capital in a rapidly modernizing economic, social and political context. In doing so it provides a vivid picture of contemporary crime and crime control in China as well as analyzing the very particular Chinese approach to community crime prevention, looking at such social institutions as the household registration system, the neighbourhood committee, the work unit and the public security bureau. The particular focus of this book is on BLSCC − Building Little Safe and Civilized Communities − in the city of Shenshen which has been undergoing rapid change. The book looks at two contrasting communities within the city, looking at their different characteristics and the differing ways in which social capital operates in relation to crime and crime prevention. 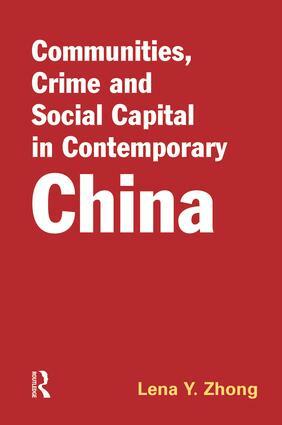 As well as shedding light on the hitherto largely hidden subject of crime prevention in China this book also makes an important contribution to wider debates about social capital and its potential, an invaluable study based on unique research.